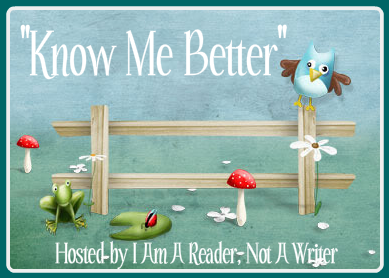 “Know Me Better” is a new weekly meme hosted by I Am A Reader Not A Writer. Each week five questions are asked as a way for your readers to get to know you better. Want to play along? It’s easy! Just click the link above to take you over to the host’s page. From there, copy and paste the meme image into your blog along with the meme code. Link back to the host and you’re done. The past. I’m a history nut. I wasn’t a fan in school, because it was dry and boring, but now I love to read historical fiction and memoirs. Books that put you there and make it come alive. I wouldn’t be picky about the particular time, as long as I was just visiting. Regency England might be cool for a few days… or colonial America…or 1950’s America… Sorry. What was the question? I’m sure some people call me things other than my name, but I don’t really have a nickname. What was your favorite children’s book? Charlotte’s Web, even though it made me cry. (If you’ve been around a while, you know the rule about that.) In fact, I had to stop reading it and ask my mom to read the end to me. If you were a super hero what would your kryptonite be? Hot. I hate cold weather. I know. After my last answer, that makes no sense. Fortunately for me, there is no “must make sense” clause on this blog.